휴, 베트남의 루비 비스트로 호텔 - Hostelworld.com에서 저렴한 호스텔과 숙박시설을 찾아보세요. The following group types are not accepted by this hostel: College / University, Stag/Hen/Bachelor Party, Cultural Group If you have misrepresented the type of group you are booking for, your booking may be cancelled by the hostel." 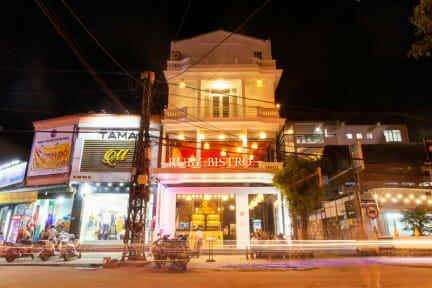 Ruby Bistro Hotel near the is located on Chu Van An, Pham ngu Lao street. This will turn to a walking street on 29 September 2017. On week days vehicles are still allowed to run along this street, but from 6pm to 2am on Friday, Saturday and from 6pm to 12am on Sunday, all kinds of vehicles are not allowed to travel here. Typical street activities also appear more and more on this walking street. This is truly an ideal location for dating, fun, entertainment, and many other activities. If on this holiday you are coming to Hue city, then do not miss the opportunity to walk on Chu Van An , pham ngu lao , walking street.